With each passing year, social media gets bigger and bigger. We can connect with other musicians all over the world. Cameras and cell phones have also allowed for musicians to learn music and connect with others online. I love using technology to learn more about music, to share my own recordings, and to help others with their musical journey. Certain social media sites have growing communities of musicians. There are many Facebook groups dedicated to classical musicians. Some are general music groups, and others are for players of specific instruments. Different groups work differently, some are more conversational and others focus more on sharing links to music: recordings and sheet music. I am in a few flute groups and a couple of general classical music groups. I can pose questions, share links to my recordings and this blog, and I can answer others’ questions. The music community on Instagram differs significantly than that on Facebook. There is less conversation on Instagram and more sharing. Like sharing videos and photos related to music. Comments on photos and videos allow connections with other musicians. Compliments and constructive criticism can help not only the one posting the video, but others who watch the video and read the comments. Instagram stores also let users share more content and give others a look behind the scenes. Computers allow us to access social media, to watch videos on YouTube, to listen to recordings of great musicians, and more. There are also different audio and video programs that allow you to record and edit clips of your playing. Garageband and iMovie are good starter programs for Mac, and similar programs exist for Windows. Computers are probably the most famous piece of technology, and there’s a lot of stuff we can do with them. There are many online music courses that you can take from the comfort of your own home. You can even take private music lessons online. We can also buy sheet music and other accessories online. Cell phones allow us to use social media on the go. You can also download apps like YouTube and Spotify. Phones make for great, cheap, tuners and metronomes. You can also uses the Facebook and Instagram apps to connect with others on the go. Cell phone cameras also allow us to record videos and audio clips without the need for a fancy or expensive camera. Phones are a great way to keep up with the online music community and listen to recordings whenever and wherever you are. Technology is a huge part of our daily lives. We use it first thing in the morning and last thing at night. Why shouldn’t we extend that part of our lives to music? Just because I play classical music, that doesn’t mean that I have to stick to the technology they had back in that period. 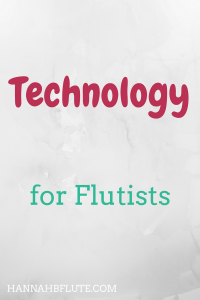 How do you use technology as a musician? Let me know in the comments!